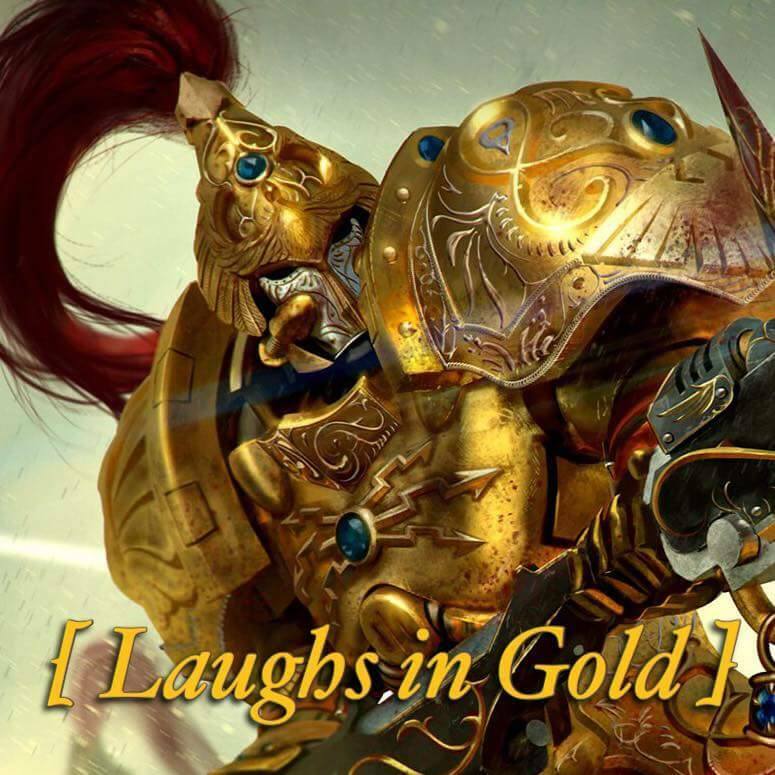 So I've finally managed to get hold of the first few boxes of Custodes I will need for my initial 1000pt army. I know that at the start of the year I would only start on a Custodes force when I had finished some more projects, but due to my decision to sell my Dark Angels and Imperial Guard I somehow managed to justify spending my cash on a few boxes of Custodes. I had bought some gold spray paint a while ago for my Sisters of Silence and I've had some free time after exams so I couldn't help but start putting things together and laying down some base colours. So the core of this force will be two squads of three Custodian Guard, one with spears and one with swords. 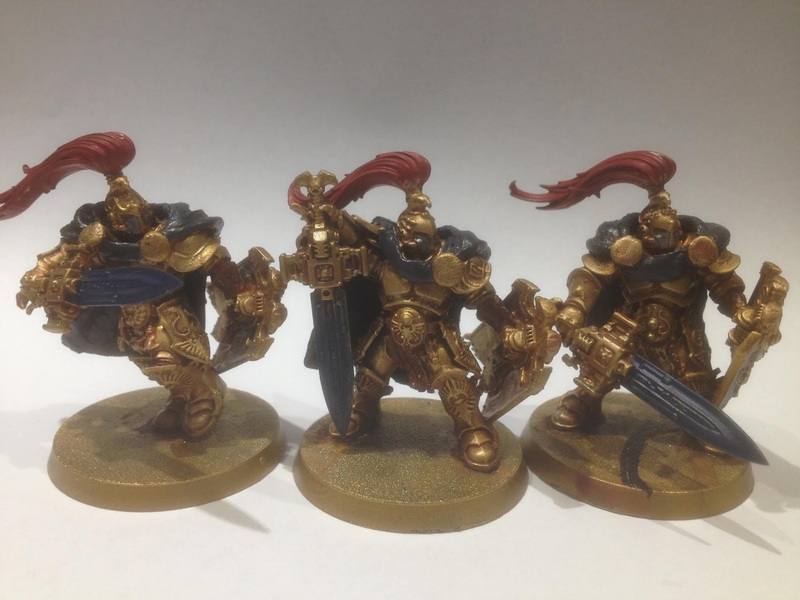 To make these I have mixed and matched three Custodes with three easy-build Stormcast Liberators, alongside some spare bits. One thing I've really tried to do with my Custodes (where the kits have allowed it) is to create a strong, square silhouette. I decided to start this force back when Trajann Valoris was first previewed because I loved how square he was and how solid and intimidating a look that is. I've therefore endeavoured to create a 'squareness' to my Custodes, creating vaguely square silhouettes by refraining from using tall helms and changing poses to create strong visual lines. Fluff-wise I am terming this force: the Mourner-Host, being composed of members of the Adeptus Custodes who ordinarily do not leave the confines of the Imperial Palace due to the fact they primarily do not serve the Emperor in combat-roles. These are his librarians, his philosophers, and the private executioners of his will. Though they maintain a traditional colour-scheme of gold and scarlet, they continue to wear the black of mourning as they mourn not only the Emperor, but also the death of his dream for humanity to which they were particularly close. They have been gathered by the Lord-Historian, newly wakened from his millennia long cryo-sleep, to accompany him on his travels through the Imperium. The wisdom, knowledge and ideals they bring with them, will be a familiar assurance to the Lord-Historian who has found himself in an Imperium far more alien than any he has awaken in before. Apologies for the poor photos, I only had my phone camera available and not the best lighting conditions but you get the idea of what I'm doing. 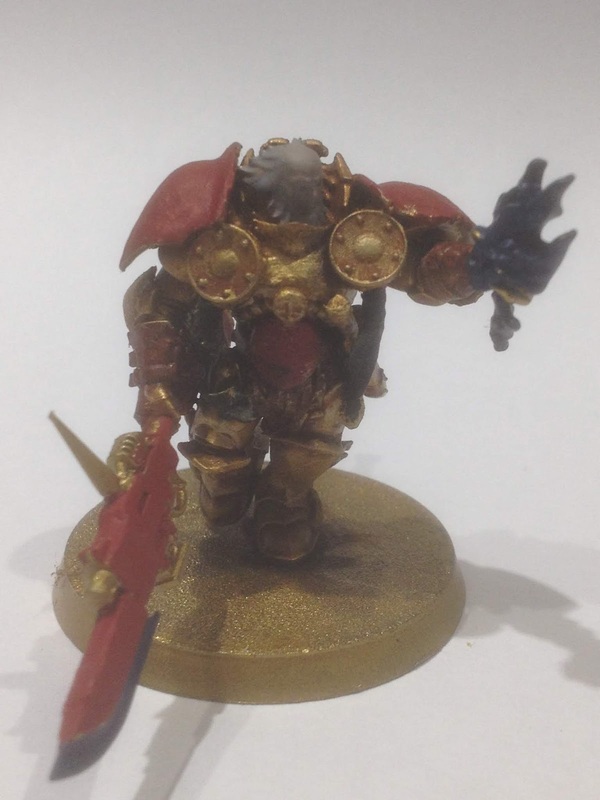 Made using Custodes torsos and Stomrcast legs, this is a conversion I have seen many times before and though looked quite effective. Mix and matching Custodes with Stormcasts was not as difficult as I thought it might have been, it just required a little thought when cutting and some use of green stuff to cover the few gaps. I then added Allarus helmets to keep their silhouette low and squarish which I'm going to paint red in lieu of them having crimson plumes. I've added books at their hips as I imagine these as the keeper's of the Emperor's personal library on Terra. 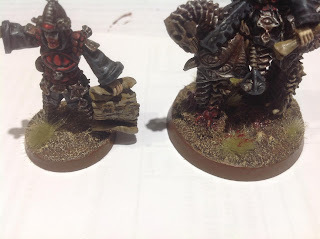 They are loyal servants of the Lord-Historian who attend to him while he is in cryo-sleep, now venturing forth at his side to collect new materials for the Emperor's library. 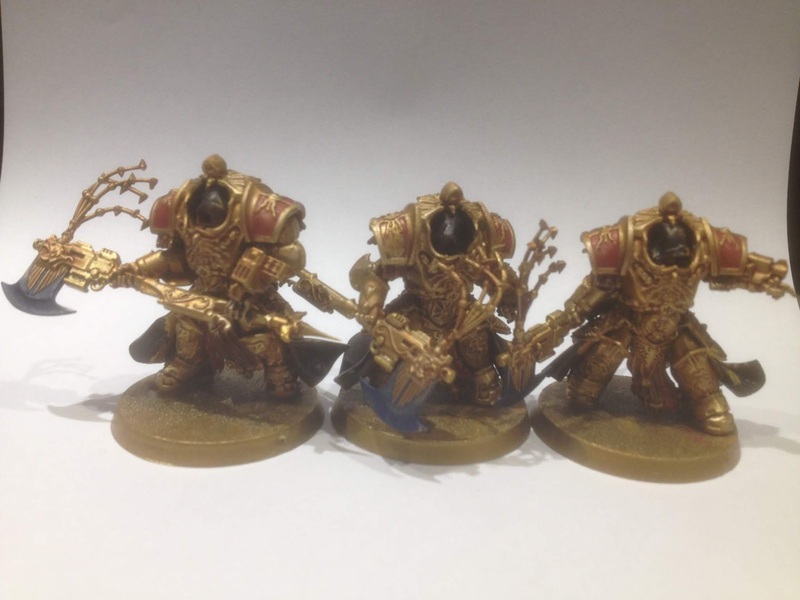 So I made these using a combination of Custodes legs and Stormcast torsos. 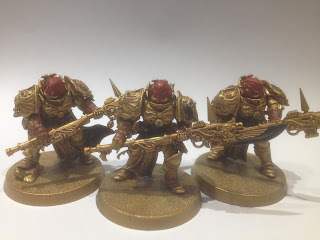 I've been very unimpressed with attempts I have seen by a few people to make the most of the Custodes kit by simply sticking spare heads and weapons onto Stormcasts. In my opinion they just look like Stormcasts holding the wrong gear, and I think my torso/leg swap is much more effective at making them distinctly custodian. I've also added some cloaks to help add 'squareness' around the shoulders and emulate the robes of mourning seen on the cover of the book 'Watchers of the Throne' which has served as inspiration for my colour scheme. These individuals with their long plumes and ornate armour are philosophers, they are known as the Watchers because they spend much of their time standing upon the walls of the Imperial Palace, looking out over the surface of Terra and ruminating on the nature of death and sacrifice. I've then build two Shield-Captains with the appropriate load-out to lead each squad. 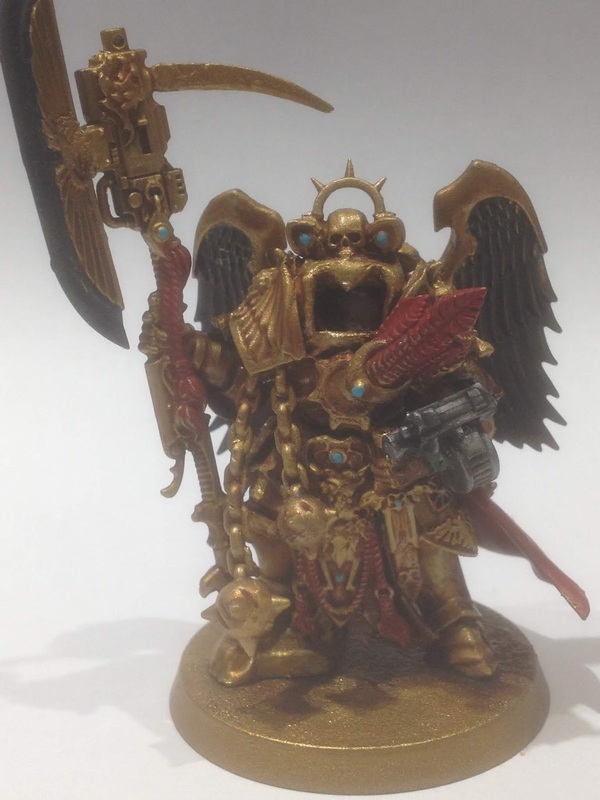 This was the very first character I envisioned for this force and rather than waffling about how I put him together I'll just paste my first write-up of fluff I wrote for this army: This grim Custodian never speaks, indeed no one knows quite who he is or how old he is. His armour is certainly aged and atop his head The Wall wears the helm of an Imperial Fists Legionnaire. Many believe he was there upon the walls of the Imperial Palace when the traitors laid it to siege (from whence he has gained his moniker from the Watchers) and wears the yellow helmet in remembrance of a fallen companion from that battle. Whether he is a truly ancient Custodian, or if many have inherited the armour and role, nobody knows. When he leaves the Palace, he is followed by a procession of Custodians who feel drawn to him as a manifestation of the Emperor's will and follow his silent commands into war. Mysterious as The Wall may be, he is respected and revered by his fellow Custodians for being a near-mystical expression of of their order's duty and vigil of remembrance. I wanted to try and adapt the look of a basic Custode, making them sleeker and more agile looking. 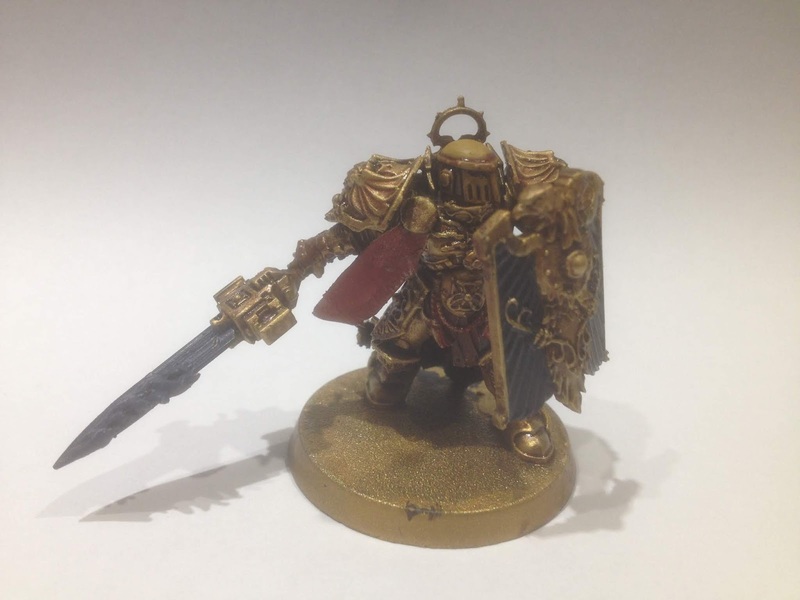 My initial idea was to convert a squad of Custodes Assassins but non of my ideas panned out so I decided to just take my best ideas and apply it to a single miniature to use as a shield-captain. Fluff-wise, he is a keeper of ancient knowledge from old Terra, a master of mysticism and an expert on long-extinct ideologies that promised their adherents enlightenment. His armour is not marked with the same symbols of the Emperor as his brethren, instead I will cover it in arcane glyphs from times long forgotten. Alongside this core of my army I have my Allarus Custodes who I think are absolutely gorgeous miniatures. As hunters of enemy commanders, I decided to make my unit look like grim executioners and swapped out their heads for ones with cowls from the Deathwing set, while removing the plume to lower their profile. This order was responsible for the execution of prisoners, political dissidents, and others during the Unification Wars. They persisted until the time of the Horus Heresy and the Scouring, keeping a level of fear and order on Terra in that turbulent time. I happened to have another Stormcast body from an old abandoned project which I have extensively converted into a Shield-Captain in Allarus armour. The Lord-Iconoclast joins the Executioners but has a duty beyond simply killing the leaders of the Emperor's foes. He is also tasked with the destruction of enemy artefacts. This position has existed in some form in the Custodes since the Unification Wars where the Lord-Iconoclast was charged with the destruction of ancient Terra's holy places following their conquest by the Emperor's armies. I see him and the executioners as those more responsible for clean-up and pacification than actual combat, but now sally forth with the Lord-Historian in hopes of fulfilling their ancient roles in a new galaxy. It was my birthday recently and I received some more Custodes stuff which I should hopefully start work on soon. This includes some Vertus Praetors whose helms I've already purloined for the Watchers, Trajann Valoris himself (who I'm very excited to work on), and Tribune Ixion Hale from Forge World who I plan on converting into my Lord-Historian who will lead the force when I'm not fielding Valoris. Lots still to do on these current ones though and I hope that this entire project doesn't end up lasting longer than this year!